Voicette Amplified Stethoscope A great new noninvasive instrument helps differentiate and document symptoms of dysphagia. The pediatric-size stethoscopic microphone comes fastened to a tracheostomy tube neckband that accommodates any neck size and tension preference. 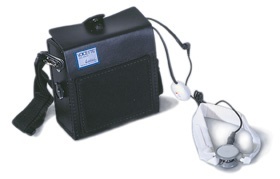 Voicette amplifier allows the clinician to listen to and record swallowing sounds. This device can also be used for training clinical students in proper and improper swallowing to teach the client to reproduce "correct" swallows. Amplifier can be connected to a speaker for group training or to a tape recorder, telephone terminal or ear-phones. Includes rechargeable built-in Nicad battery, 120V charger, extra neck band, and snap-on nylon shoulder strap 2lbs. Two year guarantee.